Cambridge Centre for Sixth-form Studies (CCSS) is an independent, international sixth-form college based in Cambridge. Following initial insight activities, it was clear the college was experiencing low awareness levels across key audiences, modest visibility in media and limited outreach in key international markets. Sable were engaged to deliver a new strategic creative direction including competitive positioning strategy, visual and verbal identity and core marketing materials to address these issues. As a first step we worked closely with the CCSS team over the course of an academic year, researching their market and competitive environment, understanding the strengths and weaknesses of the CCSS proposition, interviewing key stakeholders and walking the corridors, sitting in on lessons and talking to students. 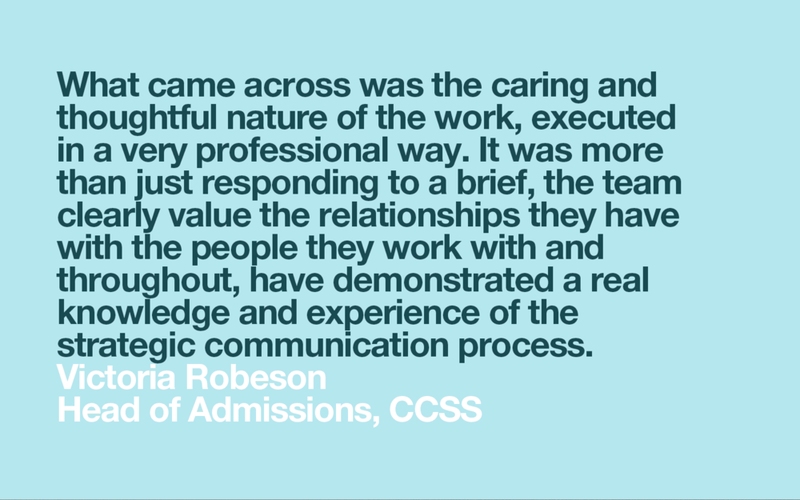 Throughout the interviews, workshops and research, we identified common themes that helped articulate the distinctive character of the college and its staff, which were then distilled down into one single strong idea. ‘Inspiring education’ is the short form of their new brand narrative, that single strong idea that sums up what is authentic, distinctive and defendable about CCSS, distilled down into one clear and compelling line. It defines purpose and sets the foundation for their new creative direction, positioning CCSS with a more heavyweight/intellectual edge, ambitious for students, parents and faculty alike, with positive standards and a commitment to lifelong learning built in. ‘Inspiring education’ comes to life in how the college acts, speaks, thinks and looks, assisting in day-to-day decision making as well as guiding long-term strategy, providing the college with a sense of purpose and direction. Every day we communicate with the world in a myriad of different ways. But that does not mean we should be saying a myriad of different things. As part of the process we developed a new verbal identity that introduced a particular tone of voice for communicating the new brand narrative, which was implicitly positive and uplifting, modern, confident, passionate and grown up. And to make it so simple and clear for anyone coming across the college, to know who they were, what they stood for and why that was a positive thing, we formalised that verbal identity into a set of voice and copy-writing guides.